As we’re seeing in the personal electronics market, the analytical chemistry market is following the trend, “double the performance in half the size.” As chemistries and workflows are becoming more complicated, the need for new, innovative materials on the fluidic path and new instrument designs that produce better results in a smaller footprint are becoming more critical. Does that sound like something you’re trying to achieve? This article is part of a series where we are taking a deep dive into some trends in the world of chromatography. In a search for the cheaper, smaller, faster and more efficient, we’ll take a close look at tools and techniques needed for exactly these kinds of advances. Understanding these trends will help bring the future of drug discovery into focus. For a look at what trends we’ll be covering, here’s an overview: The 6 Trends to Look Out for in Chromatography. In the coming months, we’ll be taking a closer look at topics like real time sampling, integrated assemblies, portability, and more. For this article, the focus is all about the trend toward a smaller footprint. 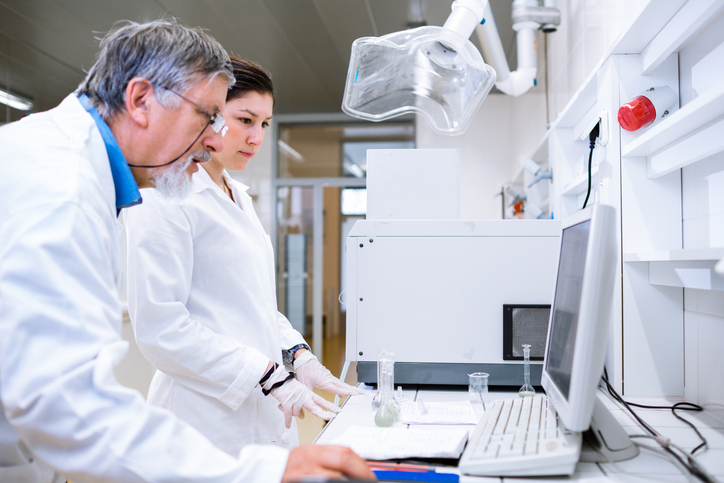 As analytical tools get smaller, chromatography is benefiting in ways that may surprise you. A smaller footprint has wide-reaching effects. Instrument manufacturers and end-users alike are eager for innovative materials and instrument designs that produce better results in a smaller footprint. So let’s take a closer look at the benefits to be found and exploited by going smaller. We are used to seeing labs with HPLCs, Mass Specs, and GCs sprawled across a massive room filled with analytical chemists. But that’s all changing without negatively impacting throughput. The highly specialized equipment you work with is changing, sometimes subtly, sometimes dramatically. The demand is ever-present for the tools you work with day-to-day to become more compact and multi-functional. Various parts of analytical instruments are getting smaller and advances on this front are happening continually, and we’re seeing that in everything from flow paths, using manifold design instead of tubing. Where else is chromatography getting smaller? Dwell volume is also shrinking. Column media is becoming smaller, so you need less of it for separations. Enhanced separation efficiencies are building on advances in superficially porous media technology as well. One really interesting dynamic at work is that a smaller footprint can also mean doing more. And you can do so much more through parallel processing. Take a look at how the ThermoDuo UHPLC system allows you to handle three separate workflows on one instrument. This kind of parallel processing allows for a quicker return on investment. This video does an excellent job of explaining the capabilities of this smaller system. There are also design features you might not think of that create a smaller footprint in the lab. Electronic sensors used in your work are also becoming smaller, more powerful, and are having a greater impact on your work, which we will get in to momentarily. Other enhancements to electronics like touch screen displays are eliminating the need for keypads. The tools you use will always have an impact on the speed and accuracy of outcomes. Smaller, higher functioning instruments are creating a smaller footprint in the lab and making a big impact on workflow that cannot be ignored. ● More Room. We’ll start with the obvious spatial element. Smaller instruments mean there is less space taken up on workstations and lab benches, giving you more room to work. These smaller analytical tools generally weigh less than their larger counterparts. Thus, they are also more portable, so some of these instruments can be taken from the bench to the field. A big lab with big equipment might look impressive, but functionality improves when scale is smaller. Just imagine what your lab could look like if you cut the size of the equipment in half. You could get double the output, since scientists could be able to manage twice as many machines at one time because they’re all close together in a single workspace. ● Throughput. Another positive implication of a smaller footprint is on throughput. Throughput increases as sample sizes and dwell volume decrease. And as noted earlier, advances in parallel processing capabilities speeds the throughput you are able to generate. All of this adds up to faster runs, using the shorter columns and the higher-pressure pumps now at your disposal. ● Ergonomics and Economics. With instruments becoming less massive, you get some ancillary ergonomic benefits as well. You can put supplies like solvent bottles and other equipment within easier reach. Another benefit you might not think of right off the top of your head is that smaller instruments mean lower solvent consumption, which means cost savings. Lower solvent consumption also means a greener workflow. A smaller footprint has far-reaching effects: it means faster throughput, greater speed to market for the innovations you are working on, not to mention savings in space and labor costs. It is a trend we’re paying close attention to. Mott is working with partners and clients around the world on managing footprints, so they can save time, money, and work. There is so much to discuss on this and the other trends we’ll be delving into in this series. Feel free to shoot me an email or connect with me on LinkedIn to start the conversation. No matter where we connect, I’d love to hear your feedback and I’m looking forward to the conversation. As always, if you would like to connect with Mott about chromatography products or would like to discuss the design and development of your next filtration or flow control device, feel free to contact us using the button below.